Fashionable Fabrics is an online store offering designer novelty fabrics, sewing patterns, books, and notions. Unsatisfied with the selection in large retail chains, the shop's owners founded the site in 2004 to help crafters and sewists get their hands on unique prints from their favorite designers. 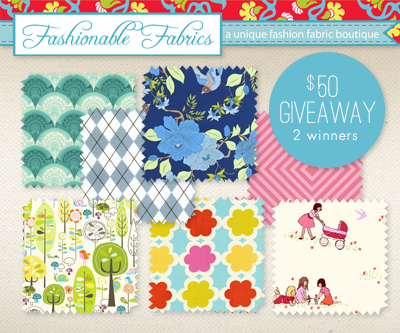 Fashionable Fabrics is giving away a $50 gift certificate to two lucky How About Orange readers, good towards anything in the store! International readers are welcome to participate. To enter, leave a comment on this post mentioning something you'd spend the money on or a fun project you have in mind. Make sure you include a link, email address, or other way of contacting you. The giveaway closes Friday, August 5th at midnight CT. Two winners will be randomly drawn, announced on Fashionable Fabrics' Facebook page on Monday the 8th, and notified. Good luck! Giveaway is now closed. The winners were Jane and Khala—congratulations! I would purchase whimsical fabrics in blues, greens and browns to use for fabric flowers at my September wedding. I'm DIYing all of my decorations! I would buy pretty fabrics for doll dresses for my little niece! I would buy fabric for one of the many baby quilts I seem to be making lately. It seems all my friends and family are reproducing, and baby quilts are a great gift. Wonderful giveaway. I love Heather Bailey's colorful collections but would also look for fabrics with touches of red to spice up things around my home. I would buy fabric to make some throw pillows!! I would make some cute bags for my daughter, who keeps asking me for a "kid sized purse" (she is 5)! This is a great opportunity, thanks a lot. Fashionable fabrics have sucha a great selection of fabrics! I think I would buy something to make two winter robes for my kids (2 and 5 years old). I love the "Ready, set, go" collection by Ann Kelle, I think it would look great on them! To start, I would definetly buy the entire Children at Play line - love it! I love the girly flower fabrics - Sugar and Spice Sugar Main in Blue by Riley Blake Designs is probably one of my favorites... perfect for making adorable dresses for my little girls! I would love to have some of their pretty floral voile fabric. Perfect for a summer dress. I am in love with many fabrics on your site! They would be excellent for my purses! Many of your novelty fabrics are perfect for my style, and you have a lot of beautiful dot fabrics too! 2 of my friends just had a baby. I want to make a 'welcome-baby'blanket for them both. A blanket in a really nice fabric, that they kan keep and cherish and hopefully give them sweat dreams. how fun!! I love to use cute fabrics along with my paper crafting projects. they're great for covered buttons, fabric flowers and more. I want to try mod-podge on fabrics and make some awesome canvases for my daughter. Oh, I would love to win this. I've have many different projects in mind. I've been making a lot of fun headbands lately. I've also got my eye on an DIY Anthropologie purse knock-off. I would purchase an Amy Butler purse pattern & then the fabric needed to make a purse, or two. I'd get some fun yellow fabric to make some curtains for my living room!! I would definitely purchase some of the Children at Play fabrics- have been drooling over them for so long! I love the green Griffith Leaf in by Alexander Henry Fabrics. It would be perfect for a dress or clutch! I would buy fabrics for gift-giving...I'm in the process of makeing a bunch of Christmas gifts! I'm having a baby girl in November and have a million projects I would love to do. We are severely lacking in fabric stores where I live, so online is the way to go!! Oh, I'd defenately buy some nice Amy Buttler bag patterns and start sewing a dream bag for (hopefully) a new job soon! Oh, I would love to buy some fabric for my daughter's bedroom curtains. I love all the playful and modern patterns. I would love to make fun tablecloths for our new home! If I could I'd buy everything!! but the fabric line Children at Play is just so darling cute!! Perfect for a quilt for my newborn niece.. I love the Meadowsweet Daisy Path in Robin's Egg fabric. I think it would be perfect for a DIY photobooth idea I have for my baby's first birthday! I have been wanting to make myself a new purse but i haven't been able to find the right fabric. i am sure i could find the perfect fabric there!! I would buy fabrics to make the finishing touches on the baby's room. Who would have thought it would be taking up so much of my pregnancy making sure it's *just right* for when baby arrives? I would buy as much unique and colorful fabric as I possibly could to help build my stash! I've been wanting to make some cute curtains for our living room for forever. That tree fabric is fantastic! My growing boys need new pj bottoms! There are some adorable robot fabrics to use! I would purchase fun fabric's to make the quilted wine totes that I came across from one of your blog post. Would love to make some pillows! Thanks for the great giveaway! my boyfriends sister has just had a baby girl and im dying to quilt a blanket for her, but my local fabric shop holds nothing inspirational enough for my plans. would love this opportunity to make this and other gifts. I would use the gorgeous fabrics on scrapbooking projects. I'd buy some backing for a quilt I need to finish. Thanks for the fun giveaway! My closest fabric store is over 2 hours from my house. (So I must get all my fabric on-line.) I would purchase a wide assortment to start making my Christmas gifts. Then what is left, make a scrappy quilt for my husband and I.
I've been dying to make a tuffted headboard and I need to make a new curtain for my kitchen window. This would really help me get those projects done! i would totally buy fabric to make curtains and a pennant flag banner for my little's girls room! I'll have Balerina Week on my blog soon and I'll feature lots of ballerina crafts. A lovely fabric for some bed sheets for my daughter would definitely include ballerinas. I love making burp cloths for mom's in fresh fabrics that the mom enjoys wearing on her shoulder. These fabrics are just perfect for that! Love all the fabric choices! I'm DIY'ing all of my own decorations, dress alterations, and some food for my October wedding and this would be the perfect way to add pops of color here and there! I would make brand new cushions for my patio furniture with one of these awesome fabrics! I would buy the fabric for some fun things to make for and with my daughter! I am always looking for bold pretty fun fabrics. I'd make some fun pajama pants! Ala Jessica Jones, I'm recovering the seats on some Ikea dining chairs! I would buy orangey fabric to make cheerful curtains! I'm always loving new bright fabrics to make clothes for my daughter (and gifts for the many baby showers I'm invited to). This would be a great win! I would want fabric to go toward re-upholstering my kitchen chairs, which are an awful green right now. The fabric choices are amazing. I create visual journals and mixed media art so I would have a blast picking and choosing just the right prints. Thanks for offering this giveaway! I need fabric to make some throw pillows to add a little pizazz to my decor. I would buy fabric and make my new neice (1 month old) some cute sun dresses. lovely. I'd buy some Japanese and novelty fabrics. Thanks for the chance! It's my "grey" moment now...so grey fabrics and a colorful touch! Beautiful! I've been wanting to get some lovely fabric to make throw pillows and even upholster some furniture with. They have such a great selection! I love those pretty fabrics! I'd love to get something pastel plue and girly to make a little girl's dress. Fun! I've been hankering to make little bags and bins... anything to keep me organized. Oh the fabrics are just wonderful! I have planned for holiday gifts fabric flowers for hair, bags etc for my family so getting my hands on some these adorable fabrics would be fantastic! I've had my eye on the "1001 Peeps Royal City in Basra Blue" by Lizzy House for some time. I think I'd make a tablecloth or placemats out of it. But I also need chair cushions! There's always so many projects to do! I would buy some fabric for our future nursery. Thanks for the chance to win! A new big tote bag for carrying stuff to work, the gym, farmer's markets, etc.! I would love to make my daughter some clothes out of the children at play fabric line. Thank you for the chance to win. What a great giveaway! I just finished my very first cotton skirt, and I'm itching to make another one! Hope I win. Thanks a lot for this nice chance!!! I would buy some nice fabrics for a quilt. This quilt will remember me on my really nice time in CA, where I have lived for 2 years! Aprons! I have been jonsing to make aprons for my daughter and nieces as holiday presents this year...thanks for the link and a chance to win! I would like to make something sweet/Japanese style for my daughter. There was a skirt tutorial posted on How About Orange several months ago that I bookmarked as the first piece of clothing I ever plan to attempt. I would LOVE to get some gorgeous fabric to use for that! I would make a lovely tablecloth for my kitchen table. I would make a colorful quilt! Oh, I could go on and on about which fabric I would choose, but I have to stop dreaming through their site and get to work! It would be so hard to choose what fabrics I want! But I have a bunch of skirt tutorials that I would try out if I win. I want to make throw pillows for my daughter's room, so I would choose fabric for that project. Awesome fabrics and patterns. I saw the spaceboy and robot pattern, and I would love to make those for my sons. It can be so hard to find really great boy fabrics. I want to make some fun pants for my baby boy! These look like great fabrics! i am thinking of re-covering my dining room chairs, and also of making some work aprons for my son and nephew- good start for those projects! this is exactly what i need! we bought my husband a desk the other day and it came with GIANT rectangle pieces of styrofoam that i want to cover in fabric and hang above our couch! i have been looking for an inexpensive, DIY option for wall art and this huge piece of foam is perfect... it just needs a little pizzazz via fabric!! Ooh! I have been hunting for new bag fabric and something great to make a dress out of. then there are always the baby quilts and such to go along with the quilts. Love the site. Great fabric selection. I would love to buy fabric for projects for my grandchildren. They are such a fun reason to sew! Would buy fabrics to make colorful pillows in my living room. I would give it to my friend who is having a baby and will have some time at home to create! She's a ninja with the sewing machine. This is also the friend who kicked me in the eye once. So, maybe I'll keep it for myself. Hmmm... we'll see how she behaves. We recently put our two kids- one girl, one boy - in the same bedroom. I'm using a red, yellow and blue color scheme so it's coordinated but can still have some feminine and masculine contrast. I'd love to get some more fabric for projects in there - pillows, curtains and wall decor! How do you pick? This will take some studying to get the right fabric. Love them all. Planning on making my first quilt soon. This would be perfect. I would buy fabric for a preggo dress! I love the idea of using funky, unique prints in quilts - giving a traditional pattern a modern twist. I would give the fabric to my sister who designs and makes incredible crocheted bags. She would use the fabric for the interior liners and pockets. I'm a total sucker for their animal-print fabrics, especially anything with elephants or raccoons - I'd probably start by buying up all their animal print remnants for throw pillow + decorating purposes, then finding something really awesome, probably in the vintage selection (I love those Farmdale prints!!!) for a bag or skirt. I'm about to move into my first post-college apartment and I would love some of this fabric to sophisticated but fun throw pillows and other accessories for my "adult apartment." I can do simple things so I am planning to make some nice bib for my little one, using one of those colourful but manly prints (difficult to find elsewhere) with animals and cars. And the Japanese design of course, lovely! I love bright colors, so i would buy lots of different fabrics to make a patchwork dress I'm dreaming of ! Boy and Masculine fabrics! I have 4 boys. I LOVE Rat Race by Michael Miller by the way. And any Alexander Henry boy prints. What would I make? Shorts, messenger bags, snack bags, and tunics. Maybe a quilt. I would buy fabric for a nursery! I love that fabric with the little girl pushing a baby carriage. I'd love to use it for a quilt! I would looooooove to buy fabric for new tablecloths! I Love any funky fabric! I am aiming for a totally handmade christmas. I have a few ideas in mind for some cute toiletries pouches for my mom and sister! I am always on the lookout for pretty quilt fabrics and Fashionable Fabrics have a ton! I'd love some fun fabric to make something for my daughter! I think I would get fabric for a quilt for our bedroom. The hubs found a pattern he likes - and I've got to jump on that! I'd grab some really nice bright patterns in a heavy cotton to make fabric boxes. Our first baby's due soon and it'd be great storage space in the nursery! I have more projects in mind than I have time for, methinks! Those fabrics look terrific! I have some baby gifts and wedding gifts coming up and need cute fabric! I would beeline right for those Dr. Seuss dots and not let go! I've reupholstered one MMC armchair in candy-apple red and have another waiting to be stripped down and reupholstered; that playful print and bright bright red would fit right into the room! I'd make pillows and storage cubes, but if the weight is right, I'd also make some cocktail napkins. Oooh, I can just imagine the fun possibilities! I would get one of the pretty purse frames, the olive bag pattern, and some pretty fabric to make it! Thanks for the giveaway! I'd make pajama-style pants for my son and a dress for my daughter! I would like to make some clothes for myself, but the cute prints at the top of this post make me want to make a fitted, ruffly tablecloth I spied on Pinterest! I've been learning to sew my own clothing lately and would love to pick a nice floral to make a pretty dress. oh, i have so many sewing projects on the to-do list! but first, some matching pillow case dresses for my girls. Well I would probably end up wanting fabric for my brother's quilt. He turned 30 this year and I promised him I would make him an awesome quilt. I haven't started yet and it really needs to be moved up on my to do list!! i think some fun pillows to add some color to our place would be nice. i'd love to make some pillow case dresses for my girls! I'm looking for interesting fabrics for my stash. i need to make some pillows for my apartment- a brief browse of this site has given me tons of fabric ideas!! I'd love to dig into a project since my kids go back to school on Monday! I would make some lunch bags and start on a new quilt. I have been wanting to buy some fabric for a bulletin board for work. I'm getting sick of the dreary office. I've refused to add my personal touch for far too long! Ooh, they have Joel Dewberry Fabric, which I love. The Aviary Damask in Granite would be perfect for my bedroom, where I have a bit of a yellow/gray theme going on. I'd probably use it to line the back of my bookcase. I want to make some dresses for the little girls who have just come into my life. I would love to use the Rocket Scientist for a school bag for my son, though the Genevieve Flower would be nice for a dress for my daughter. So many choices! I've been thinking of making pillowcases, just for a change. Thanks for the opportunity! Ahhhh! Where to start?? I have soooo many projects piling up. From sewing curtains for all of the rooms in the house, to creating some cute frocks for my lil' one about to start kindergarten. I think I would use this one to choose some funky fabrics for pillows for the living room couches! I would get some fabric - probably some to make a cute little dress for my niece and maybe a clutch for myself! I would make 2 shirts for my twin boys for the new schoolyear. Tweet Tweet in black and white is the fabric I would have to make something from, it's so hard to choose. Oh, my fingers are crossed! I am dreaming of making a quilt for my long awaited first baby! He's coming in the fall, and I'll take all the help I can get! I would love to get some voile or lawn, and maybe an Oliver + S pattern. Thanks for the giveaway! I have a free (junky) chair that I'm going to make over into something fun... I just need some snazzy fabric! I love love love love the Sarah Jane fabric! I want fabric to make a sling for my baby who wants to be held all the time. My daughter broke her arm last night. I would buy some fun and cheerful fabrics to make a sling. I need to make some baby pants for my new little guy -- fun and fashionable fabrics for him, please! Love these fabrics! I've been wanting to try making a small quilt and I'd love to be able to choose form these amazing designs. Thanks for the opportunity to enter! God those are all so damn cute! I would use it to make something cute for my sister - she's been crafting for me for years and she deserves something fun for herself.. a sewing machine cover, maybe? My back bedroom/office/TV room needs window treatments! Sage greens, reds and oranges. I would buy fabric for my mother to make one last quilt for her mother, my grandmother, for her 81st birthday. So generous! I would get a yard or two of the Blue Bell in pink cotton lawn to make a blouse or maybe a skirt, and some of the Bicycles in Bloom fabric would be an adorable skirt. My mom makes gorgeous children's quilts for charities, so I'd get some of the 1001 Peeps fabrics; it would be adorable in one of those quilts! I would buy fabrics for nursing covers, carseat covers. Oh i would just be in heaven! Ooh I'd buy some rockin' fabric to make some sandwich baggies! I'd add the fabric to the quilt I'm making for my daughter! I need to make myself a purse! I would love to get some of those super cute boy fabrics for a quilt! Love these prints! My mother is a quilter, and would love these. I've been playing around with other projects -- just made a great fabric belt. These fabrics would be great! I would buy fabric for sewing clothing or purses. Thanks for the giveaway! I'm making a quilt out of my husband's old dress shirts and I need fabric for the back and trim and all that. The question is what would I NOT make? I'd probably start with a bebeh quilt. I would use the fabric for a nice bag - one of those shown here on How About Orange! I love the sweet borderie line in pink and would make a baby quilt for a dear friend expecting an unexpected bonus babe! I need to replenish my wardrobe with new material and patterns. I like the look of some whimsical Alexander Henry fabrics to make a ton of pillows for my new sofa! or pajama pants! or a bookshelf quilt! or...! Oooh! I love the Children at Play fabric line. Thank you for the awesome giveaway. I would stock up on some fabrics to make some baby quilts. Plus, can you ever have too much fabric around? The fabrics look awesome! I'd love to make some cute purses and little girl's dresses with them! Wow, how pretty! I use fabric as photo props, plus I've recently started quilting, and all their fabric designs are gorgeous! Wow they have so many cute fabrics! I would love to buy some to make a quilt for my baby that is growing up so fast! I am always looking for cool fabrics for my bag making - and I am getting closer to perfecting my sewing so I can sell my bags! I'd love to have the fabric to make a pillow or a blanket! ooh! we are adopting a new baby in less than 30 days and would LOVE to make curtains for the nursery from this fabulous fabric! so cool! I would make a dress using my new oliver+s pattern. I would make quilted potholders... just so I could try my hand at quilting. This fabric would be great for the aprons I am making. I have some cross stitched panels for a quilt with my daughter's birth stats on it...she's now 9, and it's probably time to get some fabric squares to complete it! LOL Thanks for the chance to win! I just went on a pattern-buying binge and now I just need fabric! I want to make some beautiful tops and skirts. I am making a quilt out of 409 yo-yos and have only half the fabric. This would be a great place for me to buy the rest. I see they have a bunch of Michael Miller fabrics. My new obsession, I'd love to make some new curtains with one of these. I love to buy fabrics, yarn, stamps, paper, ribbon. All around craft-a-holic. I'm expecting my second boy this week and I'd love to get my hands on some whimsical BOY prints, stripes, dots, etc so I can make them each their little quilt. Thanks for the chance!